My mum is sometimes a bit reluctant to let me make her a cake as usually I got off on some failure-ish sort of tangent with odd flavours (such as that shiitake and chocolate pudding) when all she really wants is a cake that tastes good and it’s fine if its boring and you’ve made it before! And because she’s my mom sometimes I do feel obliged to respect her wishes. Furthermore this last Sunday was my grandparents’ anniversary as well–the occasion merited a cake that everyone should be able to enjoy (well, without forcing themselves). 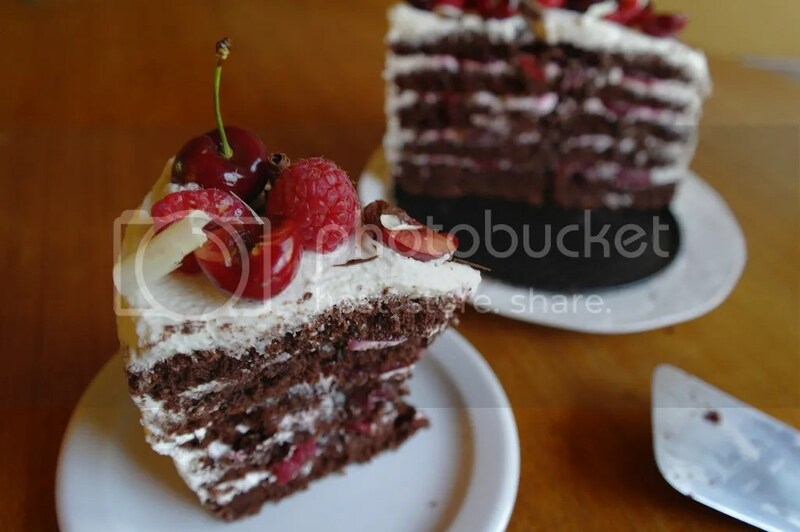 I also really like black forest cake myself. I does seem a bit retro (or at least I think; with none of that Swiss or Italian meringue buttercream here) but there’s something about a classic cake covered with whipped cream! It’s an absolute ton of whipped cream though. Yes, it seems light and you think you’re probably not having too much…but let’s not actually discuss how much cream I used. It’s better this way. Sometimes I like to sketch things out before I start; it also allows me to get some feedback–my mom quite directly rejected the first two designs. I also got quite a bit of inspiration from all the lovely layer cakes I’ve been seeing lately. Design 1 I envisioned to be plain but with some piping on top and very definition upward strokes of cream along the sides. Design 2 (the sort of funky looking one) was inspired in part by this mixed berry genoise from Born and Bred in Brooklyn (whose cake looks much more beautiful than this odd thing I was drawing) and the way that the berries just poked out of the cream; I was envisioning that along the sides of the cake between the layers. 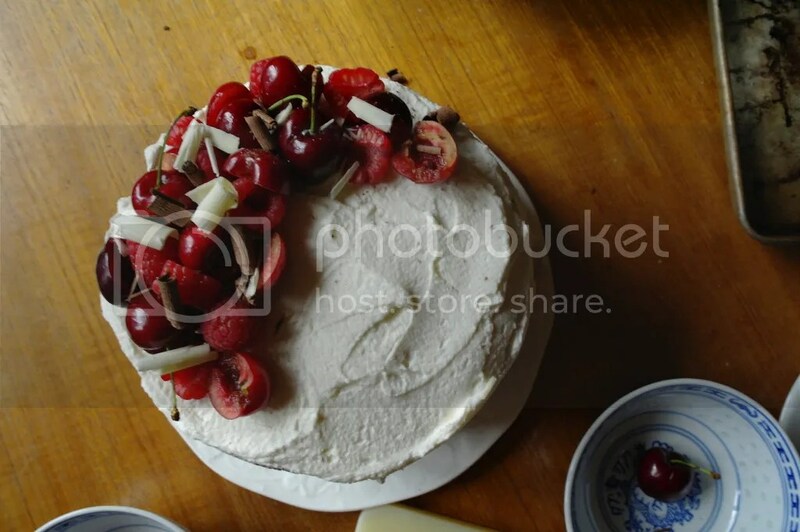 The third was more the classic sort; cherries on top and I thought I might comb the cream on the sides to create ridges. I also considered the very striking black forest cake from desserts for breakfast. The last design, and the one I finally settled on, was inspired by this beautiful fruit arrangement on top of a chocolate beetroot cake from Cupcakes and Curries and adopting the crescent shape from this carrot cake by the Domestic Gothess, The generous top was supposed to contrast the very minimally iced sides (a design choice and not an excuse due to running out of cream, though I was accused of that several times over the evening). The cake recipe is my mother’s. She once made it as a relative’s wedding cake; the annotation on the side says ‘to make every 5 years! !’ It makes an incredible amount of cake, but the batter doesn’t rise as much as I thought it would (with all that baking powder and eggs); rather it comes already quite voluminous. I ended up baking five layers in different pans of different sizes (a rectangular pan, one with fluted edges) but with some trimming you can end up with five perfectly decent layers (of quite variable thickness). So happy Fiesta Friday and a late mother’s day post! Kindly hosted by Angie, the Novice Gardener and cohosted by That’s Justine of Eclectic odds n sods and Jhuls, The Not So Creative Cook. Makes one 7″ five layer cake with excessive amounts of cream. The recipe is from my mother; I’ve no idea of the original source, nor how much it has been adapted over the years. 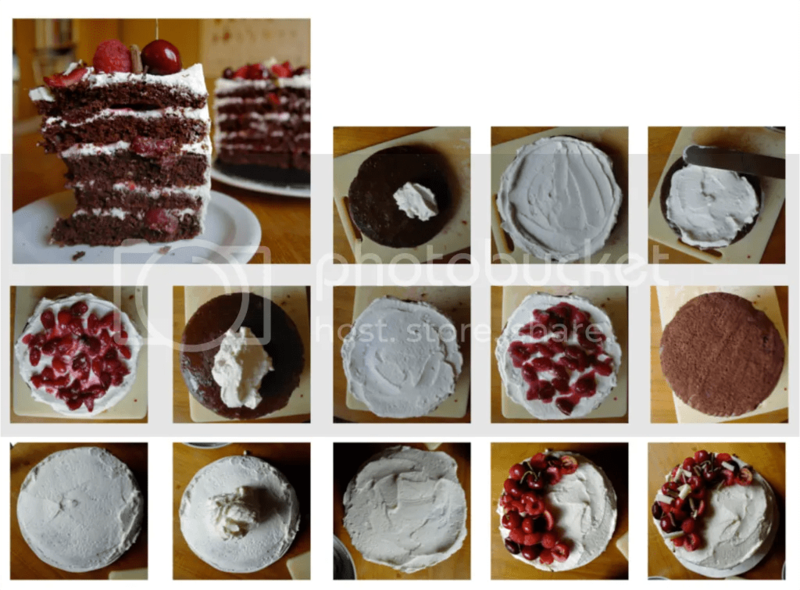 I made one rectangular cake and four cakes of 8-7″ diameter; the layers were 1.5-2 cm thick or so. 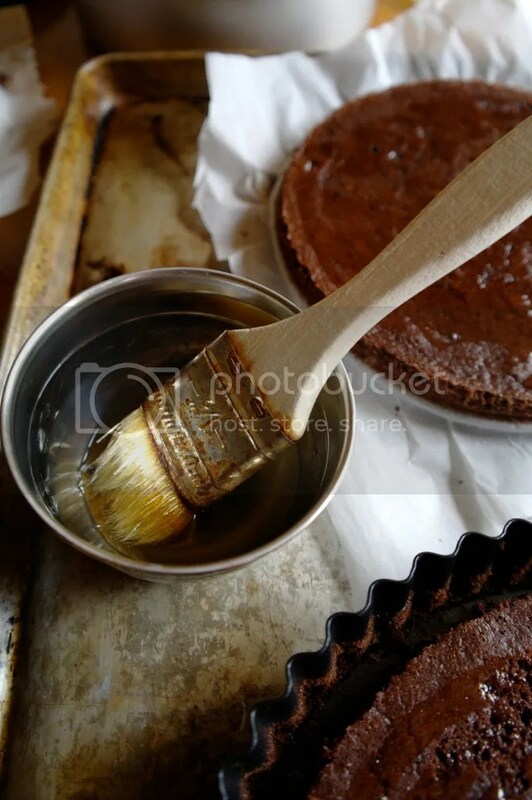 Perhaps four layers of greater thickness may be preferable–my mother did warn me though that this cake needs some support so you may not want to make it too thick. I also overbaked mine, so do watch out. Mix boiling water and cocoa, let cool. Whisk together four, sugar, salt, baking powder. Whisk together eggs, oil, and cocoa mixture. Mix into flour, beat until smooth and set aside. Whip egg whites to stiff peaks. Fold one large scoop into flour mixture to lighten, then fold in remaining. Fill one large ungreased tube pan, or a variety of other pans of varying sizes…I filled four circular pans and 1 rectangular pan to make five very thin layers of varying sizes. Four of a greater height may have been better. Don’t grease the sides, but line the bottom with parchment paper. Bake for 15-20 minutes or until an inserted skewer is removed clean. Let cool on a wire rack. I did not have too many cherries so I did not make too much and I think it could be doubled. You could also use more cornstarch; I drained the juice, but the cornstarch gave it a bit more body and helped it cling to the cherries. 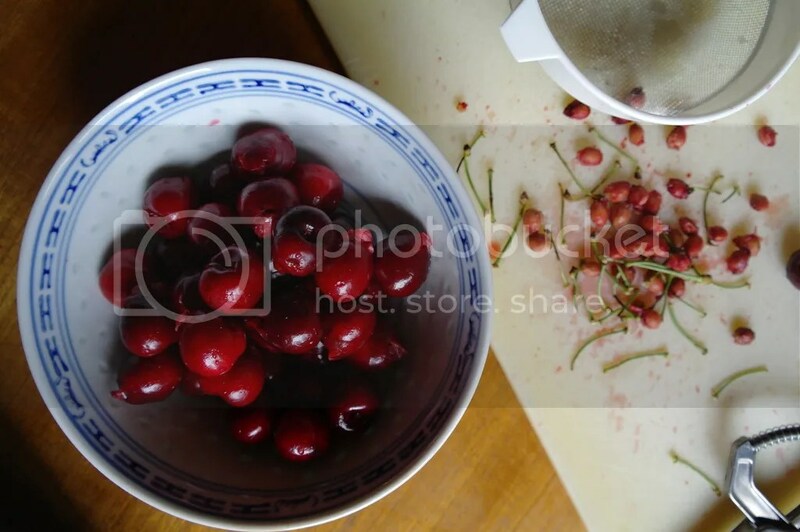 Heat cherries, kirsh and sugar until cherries release juices and become softened. Pull out a bit of the juice to make a cornstarch slurry, mix in, and simmer to thicken. Set aside to cool or in an ice bath if you’re the more impatient sort. Whip cream to desired stiffness and then whip in the sugar. Inspired by the chocolate beetroot cake from Cupcakes and Curries and the crescent shape from this carrot cake by the Domestic Gothess. Place one cake layer on a plate. Spread a generous scoop of whipped cream over top; piling it up more along the sides. Add 1/4 of the compote, draining it to remove excess juice. Repeat for the remaining layers, with cherry compote on top of each subsequent layer except the last. Minimally spread cream on the sides of the cake and generously spread cream overtop of the cake. Pit and halve some of the cherries; leave some whole. Halve some of the raspberries. 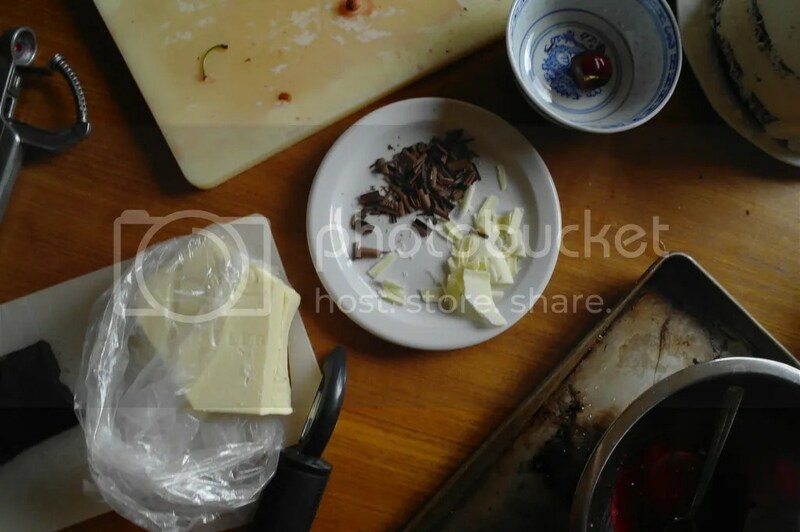 Heat a vegetable peeler in hot water, dry, and then make some chocolate curls. Arrange all components overtop. I’m impressed. Six layered cakes are no easy feat! I’m glad this cake was inspiring! And with so much cake, of course you’re welcome to a slice 🙂 Happy FF! 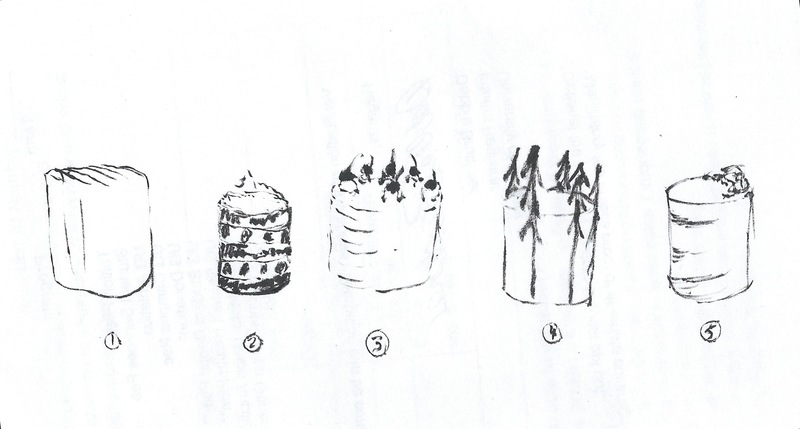 I felt the exact same way when I finished the cake–exhausted and thrilled–thank you for the perfect description! And I agree, this sort of cake should definitely make a comeback…as much as I love buttercream, it’s sometimes quite heavy and sweet so I also love having the option of a whipped cream cake. Happy FF, and do have a glass yourself! Thank you! I overcooked my cake layers unfortunately so they became a bit dry–but then with the syrup, cream and fruit it was alright! Wow! This is seriously one gorgeous cake 😀 I am so happy that cherry season has begun, because I would love to give this a try. I’m happy about any fruit season–and cherry season especially 🙂 Thank you! Thank you! It’s so great to eat fresh fruit, isn’t it! I hope you can find some more affordable berries 🙂 Have a lovely weekend as well! Happy first anniversary! What an occasion! Wow, that looks absolutely phenomenal!! 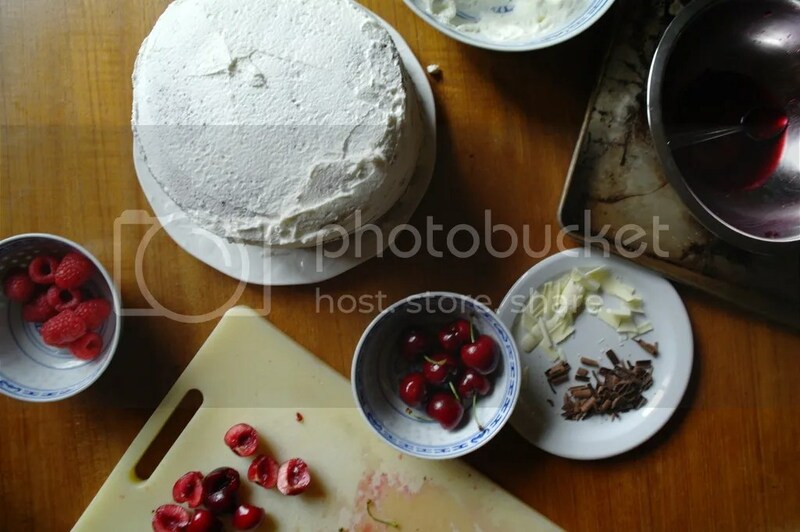 I’ve never had a black forest cake but have always wanted to try it. I also got a kick out of seeing those blue and white bowls with the rice pattern – I think my parents have the exact same ones! Thank you! Haha, yes the bowls are pretty common, aren’t they? I end up using them for everything as we have so many!